Quality manufacturer Sundaya extends its PicoPV line with the T-Lite. The T-Lite is an ideal illumination system and has a variety of uses! Whether as a ceiling lamp, table lamp, or as a manageable torch – with eight high-quality LED lamps it reaches a considerably high illumination level of 180 lumens. Highly efficient integrated lithium ion batteries provide a long period of light. In contrast to the Ulitium lamp, its counterpart, the new T-Lite is equipped with a simple touch button. 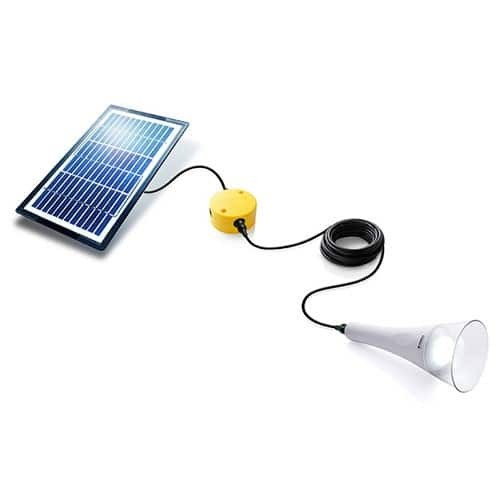 T-Lite is available as a complete kit with corresponding solar module or as a single lamp. The simple plug-and-play technology provides the highest flexibility. The company Sundaya was established in 1993 by a team of passionate people who believed in commercializing solar energy in Indonesia. We wanted to develop and manufacture personal energy solutions for the 25 million rural households in Indonesia that had no connection to electricity grids. We started out slow, but quickly grew into the needs of the developing market. In 1997 the Asian markets took a turn for the worse, and Sundaya started looking for other markets to which we could export our products. We found both Africa, and Central and South America, to be good candidates and started up our distribution. Today Sundaya has factories in both Indonesia and China, where we produce a wide range of very innovative personal energy solutions. Join our ZERO Home Bills Community. BEST Products from the BEST Brands at BEST Retail Prices for ZERO Home Bills on ZEROhomebills.com by Solaranna.